The scope and value that modern IT service delivery provides a business is increasing dramatically, according to a new research reportfrom Enterprise Management Associates (EMA). Informed by extensive research and two compelling deployment narratives, this report examines what EMA calls “next-generation ITSM” and its contributions toward optimizing changing IT and business requirements. 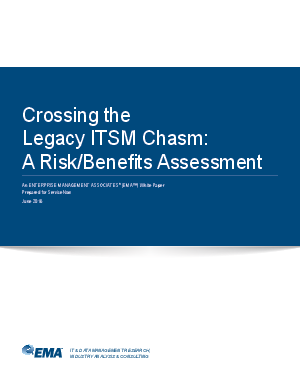 EMA contrasts these advances with the risks of staying with legacy ITSM models and then evaluates and itemizes the risks of “doing nothing” by allowing legacy ITSM to persist.